With the development of industrialization. many wasted materials are born, such as wasted auto rubber wheels, PVC material, PET bottles and so on, all these wasted material should be recycled and washed by washing machine,where are they going finally? 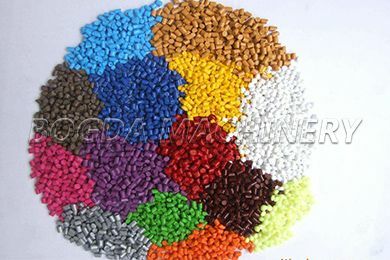 Granulating machine is used to make cruched PVC, PP,PE material into pellets. PP PE agricultural film die-face pelletizing line is used for plastic film, wire, sheet (thickness is less than 0.5mm), belt, bag and so on recycling, and has the PP PE film pelletizing line features of novel design, compact structure, reasonable layout, stable, facilitating the maintenance and debugging, Low-noise, low-power consumption. SJ series film recycling pelletizer production line is the special equipment for the film recycling and pelletizing . With compacting machine ,it could pre-compact the thin material into the small granule,making the automatic feeding material easier,and it efficiency improves the production. Cylinder type hydraulic changer with vacuum gas exhausting enables the non-stop changing filter and no leaking material.Pelletizing by die-face-cut improves the pelletizing quality. SJ series double stage pelletizing line is mainly designed for processing PE,PP rigid flake or waste film flake. The advantage of the double stage pelletizing line is better melting and the material is more clean after two filtering from screen changers.It is an ideal machine for the kinds of little bit dirty material. For screw L/D varies according to the material condition,for example,rigid material or film flake. 1. This PP PE agricultural film die-face pelletizing line is composed of belt conveyor; agglomerator; extruder; vacuum exhaust system; screen changer; water ring die; die cutting&de-watering system and silo.